The Ihrig family were German immigrants who ended their westward migration when they came to Seattle in 1883. In 1852 Adam & Mary Ihrig had first settled in northern Illinois in a large German farming community. Adam & Mary decided to move farther west in the 1870s. Their tenth child was born while they lived near Albany, Oregon, again amongst German settlers. But the Ihrig family still kept moving, and by the early 1880s they were in Seattle. Perhaps Adam & Mary thought that there would be more and better opportunities for their family in the city of Seattle, or perhaps their grown sons persuaded them to move. In the 1880s Seattle had a large German immigrant community with its own churches, social clubs and even a German-language newspaper; the Ihrig family would feel at home. The Washington Territorial Census of 1883 recorded that the older Ihrig sons worked in downtown Seattle that year as blacksmiths, butchers & saloonkeepers. Copyright notice: text and photos in this article are protected under a Creative Commons Copyright; do not copy without permission. In the 1880s Fred, the fifth of the ten Ihrig children, served as a volunteer fireman in Seattle in addition to his work in the butcher shop. From its earliest days as a sawmill town Seattle had frequent fires, and the most famous of all was the Great Fire of June 6, 1889. At that time Seattle’s fire department was still all-volunteer. The department had two pump trucks but water was difficult to obtain from Elliott Bay when the tide was out, as it was on that afternoon of June 6th. There was a system of wooden water pipes in the business area, but the water pressure was low. On the day of the Great Fire, 22-year-old Fred Ihrig fought alongside nearly every man in the city to put out the flames, but the fire advanced, consuming everything in its path. One of the many buildings destroyed was the blacksmith shop which had just been established by Fred’s 18-year-old brother, Chris. After the Fire the Ihrig brothers moved their butcher and blacksmith businesses north to Belltown, near to the saloon run by their elder brother, Adam Ihrig, Jr. The brothers prospered. In 1892 Fred married and in 1903 he was able to buy land at NE 62nd Street, east of Sand Point Way. Sand Point was then outside of the Seattle city limits and was called Pontiac. The center of Pontiac was at about NE 70th Street along the Northern Pacific Railroad tracks (today’s Burke-Gilman Trail) and had its own post office from 1890 to 1909. Today Fred Ihrig’s farm is the site of the Sand Point Elementary School at 6208 60th Ave NE. The youngest of Fred & Davina Ihrig’s four children, Ray, was born in 1904 on the family farm & orchard in Pontiac/Sand Point. Ray’s grandparents Adam & Mary lived nearby, as did several of his uncles, including Adam Jr. and Chris. When he was growing up Ray heard his uncles tell stories about Seattle’s early days and the rebuilding of the city after the Fire. Ray’s Uncle Adam continued to work as a bartender until January 1, 1916, when Washington State “went dry” four years before the start of Prohibition, the national experiment in the suppression of alcohol. In 1934 Ray Ihrig married Ida, daughter of Finnish immigrants. Her family background was similar to Ray’s in that during her youth, her father, Isaac Ekorn, had “gone West,” moving from Minnesota to Montana where he worked in a copper mine. Ray & Ida had seen their parents work hard and find new lives, and as a young married couple Ray & Ida set out to do the same. Prohibition had just ended, so they decided to celebrate the new era by opening a beer parlor. They named it Ida’s Inn, located at 7500 35th Ave NE. The Ida’s Inn building had originally been an old-fashioned grocery store, built in 1926. It was owned by the Nick Jacklin family, ethnic Russians who had lived in Alaska before they came to Seattle in 1916. Nick worked at a flour mill on Harbor Island and his wife Pauline ran the store, which was on the northeast corner of 35th & 75th, two doors south of the Jacklin’s house at 7528 35th Ave NE. 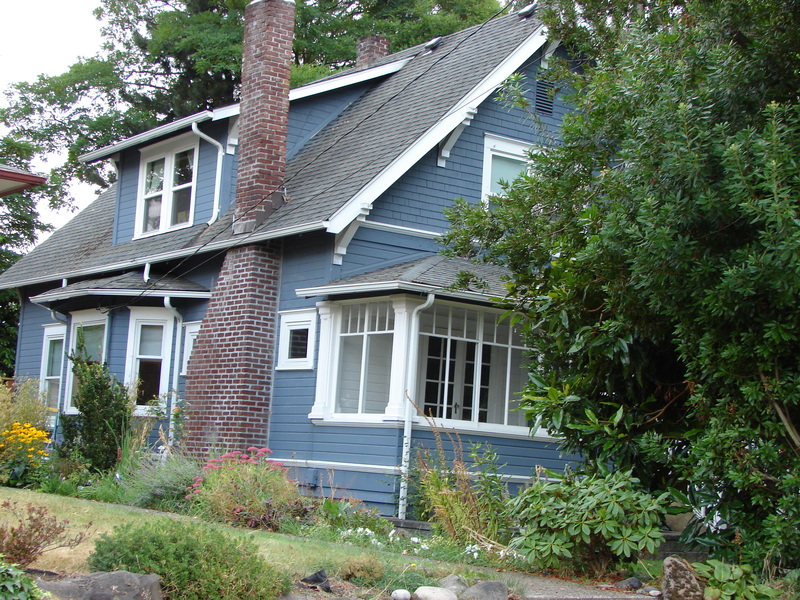 In between the store and the Jacklin house was the home of Henry & Johanna VanderWel, Dutch immigrants, at 7512 – 35th Ave NE (present site of the Chase Bank parking lot.) For decades a feud simmered between the Jacklin and VanderWel families. The VanderWels didn’t like having the Jacklin’s house on one side of them and the store building on the other. The feud worsened when Henry VanderWel, who had worked as a mail carrier for twenty years, was accused by the Jacklin family of stealing a letter which had money in it. Mr. VanderWel was arrested in December 1929, but the case was dropped. The chaos of the Prohibition years worked in his favor as prosecutors were too busy with enforcing the ban on alcohol to take other cases. In 1934 newlyweds Ray & Ida Ihrig moved into the store building’s upstairs apartment and they converted the store to Ida’s Inn, a beer parlor and sandwich shop. Ida’s Inn was the only commercial structure at the intersection of 75th & 35th at that time; the other three corners were vacant. A signpost in front of the store pointed north, up 35th Ave NE to Bothell and the Everett Highway, and east along NE 75th Street to the Sand Point Country Club & Golf Course, which had opened in 1927. Ida’s Inn beer parlor in 1938. “Oneida Gardens Replat” was the plat name with the property’s lot number and address shown. Photo courtesy of the Puget Sound Regional Archives, repository of the property records of King County. Although the years of the economic depression of the 1930s were difficult, Ida’s Inn prospered enough that Ray & Ida could build a new home on NE 61st Street, at the edge of the Ihrig family farm property east of Sand Point Way. Ida’s Inn was still in business after World War Two when the Wedgwood neighborhood really began to grow and take on an identity. By the late 1940s the other corners of the intersection of 75th & 35th were being developed, including Safeway at its present site. As of 1945, there were no buildings on the northwest corner of the intersection of 75th & 35th, directly across 35th Ave NE from Ida’s Inn. The property owner, Frank Vickers Cook, ran into trouble when he wanted to sell that northwest corner, because his house was there and the property was still zoned residential. Mr. Cook appeared before the Seattle city planning commission with a petition for a rezone, but a number of neighbors, including the VanderWels, attended the hearing and protested. The VanderWels had chafed all those years at having the Ida’s Inn tavern next door to them. They, and other neighbors, were afraid that the intersection at NE 75th Street would become a Tavern District, so they did not want Mr. Cook’s property to be rezoned for commercial development. Mr. Cook withdrew his petition at that time. The northwest corner of 75th & 35th has a row of storefronts. The next year, 1946, Mr. Cook was able to get the rezone and sell his property to a developer, Marinus Halffman, with an agreement that storefronts, not a tavern, would go into the new building. By that year of 1946, a Safeway was under development at the southeast corner of the intersection because the neighborhood had agreed that they welcomed having stores. This might have made the rezone application easier for Mr. Cook’s corner of the intersection, too. 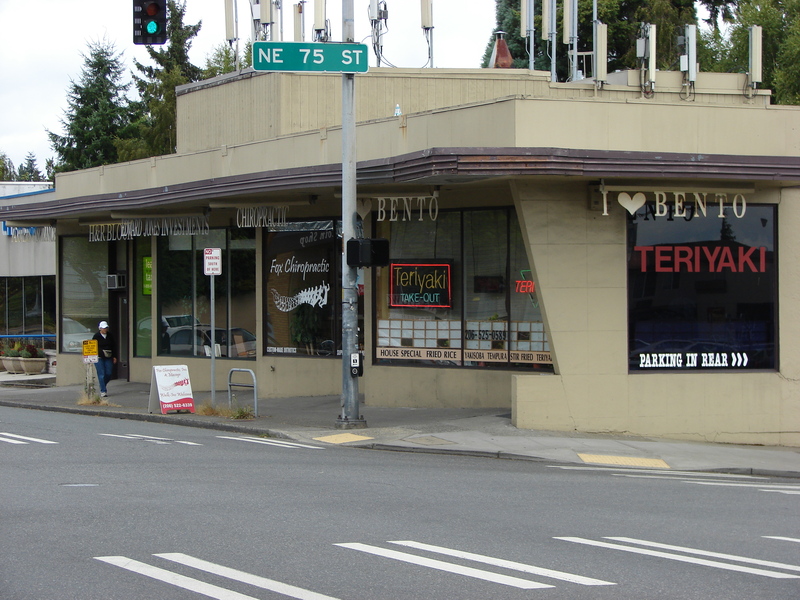 In 1950 the first businesses in the new building at 7501 35th Ave NE were a drugstore, deli, and barber. For many years the southernmost storefront of the building was View Ridge Pharmacy. From 2009 to 2017 a childcare, Blossoming Buds, was in that space. As of 2018 the corner space is being remodelled for a new Grand Central Bakery. 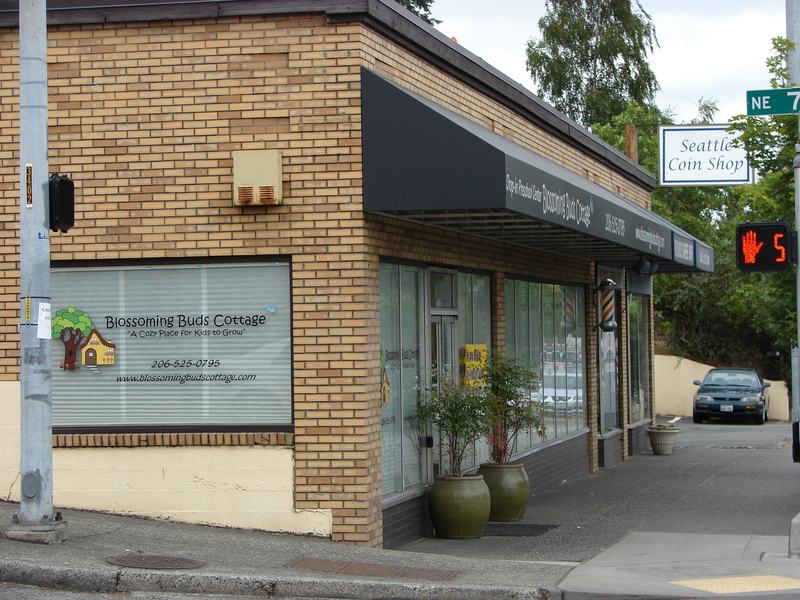 The next two spaces to the north are the Wedgwood Barber and the Seattle Coin Shop. The “tavern problem” at the intersection of NE 75th Street was resolved in a sudden and shocking way. On March 20, 1948, Ida Ihrig was found unconscious in her home. She was taken to the hospital where it was determined that she’d had a stroke, and she died later that day. She was 45 years old. Brokenhearted, Ray Ihrig closed the tavern. He went back to work at the family-owned Laurelhurst gas station where he had worked before his marriage. Above the rooftop of the commercial building at 7500 35th Ave NE can be seen the square outline of the Ida’s Inn beer parlor which has been enclosed. After Ida’s death, the tavern building was acquired by a Wedgwood resident who remodeled and added the present “storefront system” of shops. By 1950 the shops (listed from south to north) were: MacLennan’s women’s clothing; Frosty Shop Ice Cream; Binek’s Electric Bakery; Careful Cleaners; and Jim’s Shoe Repair. Today, the businesses are: I Love Bento; Fox Chiropractic; Edward Jones Investments; Rainglow Airbrush Tanning; and Farmers Insurance. The Chase Bank building at 7512 35th Ave NE (the next building to the north of the former Ida’s Inn) was originally built as McGillivray’s store in 1954. Next to it to the north was the VanderWel house. In 1955, the McGillivrays moved the VanderWel house to 7308 38th Ave NE, so that they could create a larger parking lot next to the McGillivray’s store. Today there is a Thai of Wedgwood building which is just north of the Chase Bank and which is on former Jacklin property. 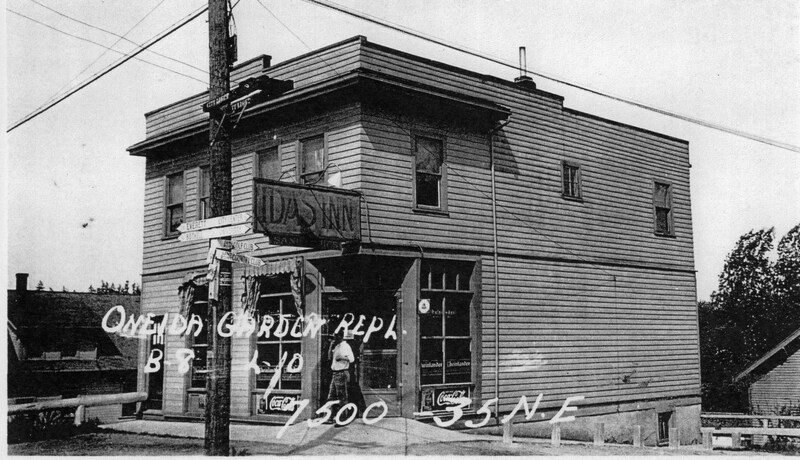 Visible above the present-day storefronts at 7500 35th Ave NE is the square outline of the original 1926 building, a legacy of the days of Ida’s Inn. 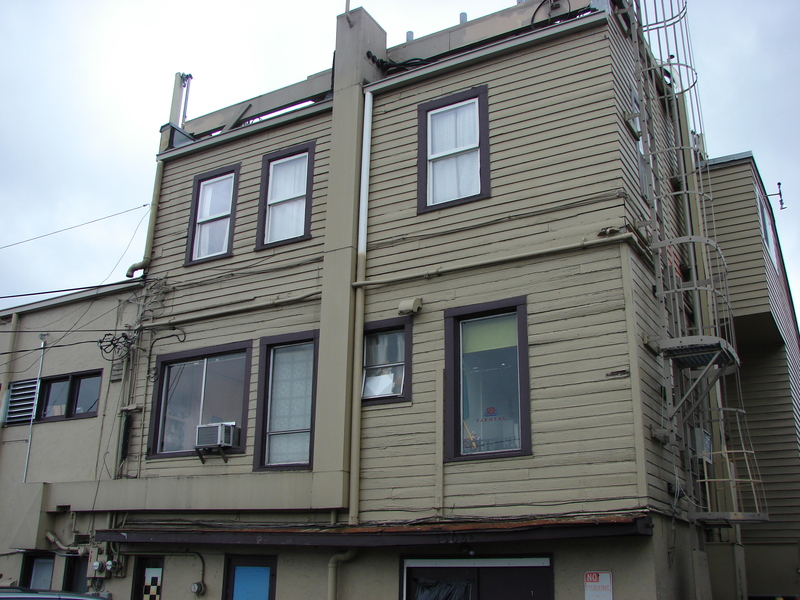 At the back of the building the upstairs apartment lived in by Ray & Ida can still be seen. Census listings show that the patriarchs of the Ihrig family, Adam & Mary, had immigrated from Germany in the 1850s and first lived in a German-speaking community in Illinois. The birthplaces of their ten children helps show the family’s migration across the USA, with the last child born in Oregon in 1879. The Seattle City Directories of 1891-1893 showed that Fred Ihrig had moved his meat market to 2229 Front Street (approximately First & Bell Streets in Belltown.) Adam Ihrig Jr. was listed as a saloonkeeper nearby, along with their brother Chris’s blacksmith shop. This was their new location after the Seattle Fire of 1889 destroyed the previous shops. “Death from Natural Causes, Mrs. Ida Ihrig,” The Seattle Daily Times, March 21, 1948, page 4. “Ihrigs to Mark Fifty Years of Life Together,” The Seattle Daily Times, October 18, 1942, page 16. Wedding anniversary announcement of Fred & Davina contains some background info such as Fred Ihrig’s participation in fighting the Seattle Great Fire of June 6, 1889. “Letter Carrier For Twenty Years Held Under U.S. Arrest (Henry VanderWel),” The Seattle Daily Times, December 15, 1929, page 11. “Mrs. Effie Ihrig, Pioneer of Seattle, Dies,” The Seattle Daily Times, July 20, 1958, page 51; includes the info that her husband Chris, had owned a blacksmith shop which was destroyed in the Seattle Fire of 1889. Property records: original photos from the Puget Sound Regional Archives, Bellevue, WA. This entry was posted in 7528 35th Ave NE, businesses, farms, Immigrant heritage, taverns and tagged NE 75th Street commercial district, Neighborhood History, Sand Point neighborhood, Seattle, Seattle Great Fire of 1889, WPLongform. Bookmark the permalink. Ray Ihrig was my grandfather Fred Ihrig’s brother. My father Fred Ihrig Jr. also worked at the Laurelhurst five-corners gas station with his brother Robert. Thank you for bringing back memories of stories I heard as a child.